Combine the chicken and breadcrumbs in a large bowl. Season with salt and pepper. Divide into four even portions. Shape each portion into a 9cm patty. Place on a plate. Cover with plastic wrap and place in the fridge for 30 minutes to rest. Meanwhile, combine the cabbage, onion, carrot, chives, mayonnaise, mustard and honey in a large bowl. Season with salt and pepper. Preheat a barbecue or chargrill on high heat. Lightly brush the bread slices and chicken patties with oil. Cook chicken on barbecue for 3 minutes each side or until golden brown and cooked through. Transfer to a plate. Cook bread on barbecue for 2 minutes or until lightly toasted. Place bread bases on serving plates. 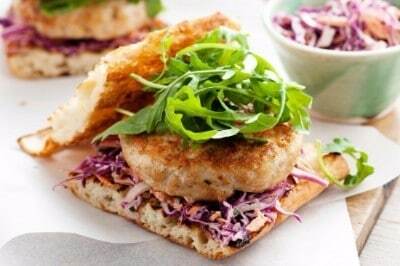 Top with red cabbage slaw and chicken patties. Top with rocket and remaining bread. Serve immediately.